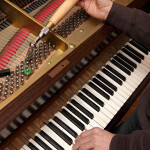 Musicians often make the best technicians because of their deep appreciation of a piano’s “feel” as well as its sound. Michael McQuilkin, a professional pianist, entertainer and educator, has over 30 years of experience bringing treasured instruments back to life. Michael is passionate about preserving the legacy of the family piano.